The next issue of Game Informer will feature over 30 pages highlighting the forthcoming PlayStation 4, as revealed by its latest cover unveiling Tuesday. The headliner for the June issue is Infamous: Second Son,with spotlight on the cover and 10 of the over 30-page feature devoted to that game alone. The latest entry in Sony’s well-regarded open-world superheroing franchise, Second Son moves to Seattle and new protagonist Deslin Rowe. Since the end of Infamous 2 (and previous protagonist Cole McGrath’s sacrifice), the government is on high alert for superpowered people and puts Seattle on lockdown, giving players plenty of incentive to step up and fight The Man. The issue, billed as “The PlayStation 4 Issue starring Infamous: Second Son,” will feature, according to the cover, hands-on info on the DualShock 4, “Sony’s new indie initiative,” and new information and screens on Destiny, Knack and Killzone: Shadow Fall. DriveClub and Media Molecule’s next outing are also featured, likely along with many other titles. GI Executive Editor Andrew Reiner notes on Twitter that the magazine also talked with Shuhei Yoshida about Sony’s upcoming console. The Game Informer crew did its due diligence hyping up the cover reveal in the 24 hours leading up to it, with Reiner noting that the feature is the largest the magazine has done since its Grand Theft Auto IV reveal, which clocked in at 20 pages. This one, which GI says is over 30, is a hefty beast, indeed. 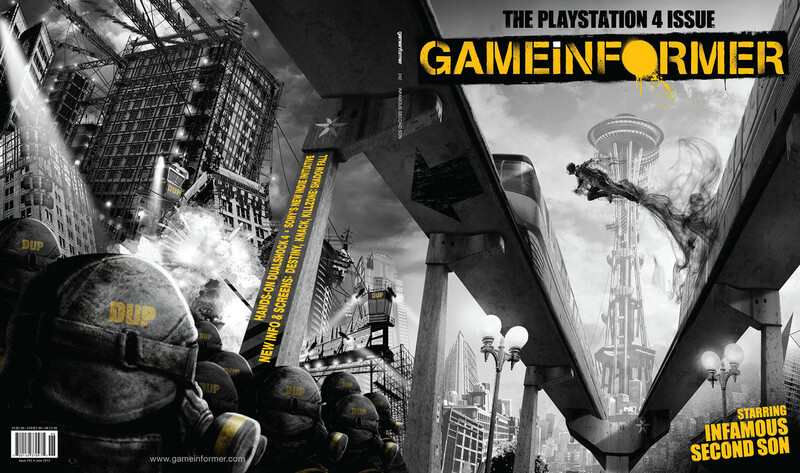 Are you excited to learn more about the PS4 when the June issue of Game Informer hits? Were you hoping for a bigger reveal? Let us know in the comments.